The project concerns the development of a platform for the‬‬ definition and integration of high-level monitors that detect security related events and‬‬ augments intrusion detection systems. The work includes participating in the definition‬‬ of an appropriate language for such monitors as well as their synthesis and integration‬‬ in an analysis tool‬‬. The monitor language should enable the definition of temporal monitors that detect‬‬ distributed security related events in a cloud based environment‬‬ The project should also inspect possibilities of integration of adaptive temporal ‪monitors as a proactive measurement of security in the cloud‬‬. Constructing a language for monitor definition: MSL prime. Building a GUI in which the user can define monitors. 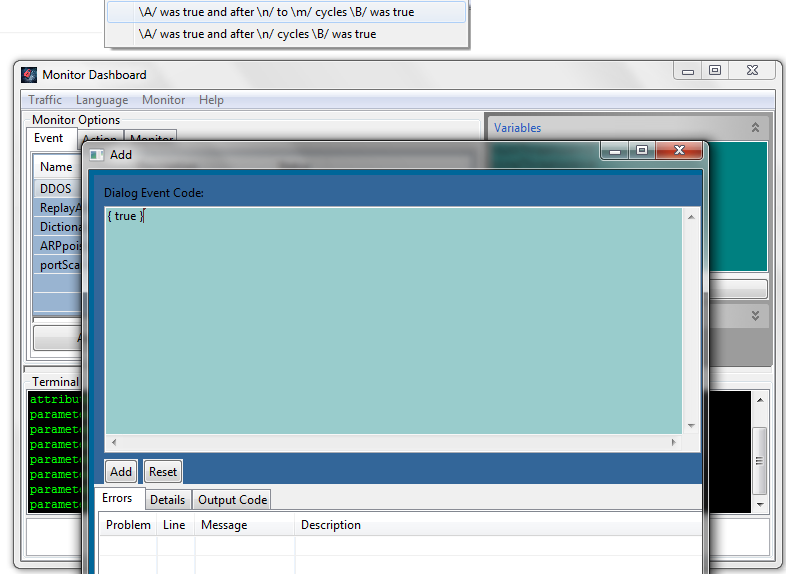 Creating an interpreter from our MSL language to compilable C++ code. Importing new languages definitions, providing the statments of the new language are translated to valid statments in MSL prime. The user will be able to specify the Data files format. The smart user will be able to create monitor templates for the usage of the simple user (see template detection under Screenshots). 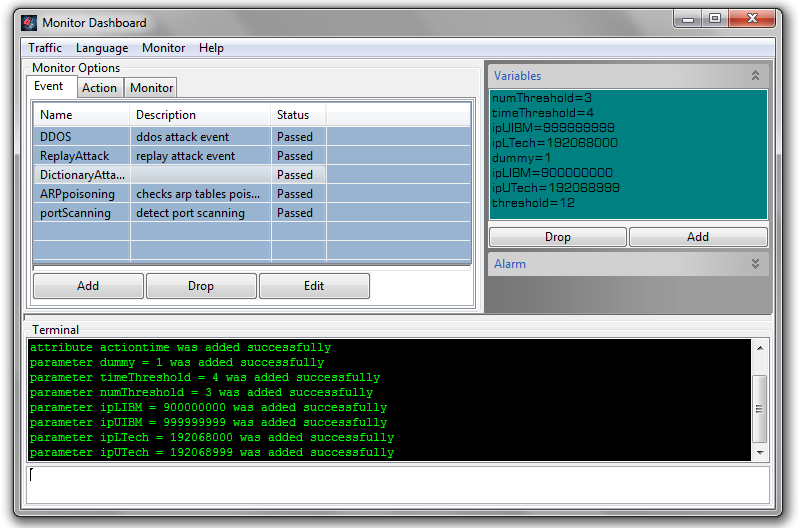 Detect the “events” specified by the user. Act as the user specified in the “monitors” and “actions”. Loading vriables and monitors form automatically from a file without the need of performing these actions manually. Documentation: user manual, language definition and documentation. JJTree was used to create an interpreter from MSL prime to an “augmented C++” files containing PSL blocks. These were in turn sent to an IBM TOOL to create clean C++ files. 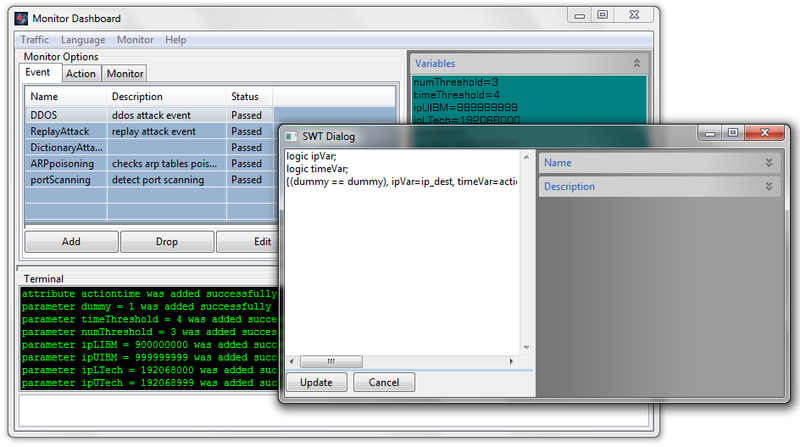 SWT platform was used to create the GUI. It was edited on eclipse and compiled using Java platform se7. The development was performed on a linux 32 bit machine. However the IBM TOOL runs only on 64 bit machines; Thus we use vmware player to simulate a 64 bit machine. The monitor specification language MSL prime was derived from known temporal logic languages such as PSL and SVA and modified for user convenience and functionality purposes. Full language definition and specification can be found under the links section. DDOS, short for Distributed Denial of Service, is a type of DOS attack where multiple compromised systems — which are usually infected with a Trojan — are used to target a single system causing a Denial of Service (DOS) attack. We will define a monitor which detecs such attacks and logs them. we will need the format to include ip_dest and actionTime attributes. The first is the destination ip of each transaction and the second is the time of the transaction. Also we will define the attributes “dummy” (which value does not matter and will be simply used to create a logical tautology) as well as “numThreshold” and “timeThershold”. A machine is said to be under a DDOS attack if it recieves “numThreshold” requests during a “timeThreshold” interval. The first “state” simply saves the destination ip and time of execution for each transaction. The second one records “numThreshold” transactions with the same detination ip and the last state checks the first and last transaction happened during a “timeThreshold” interval. 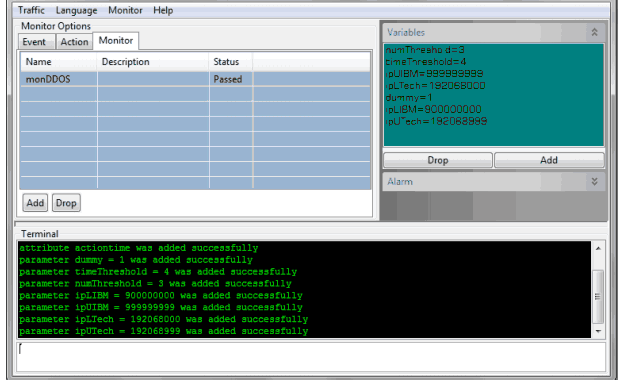 After exporting and compiling the monitors (the export all option in the console) an executable file will be created. Given a data file containing a ddos attack, the executable file will create the log file “alarmDDOS” in which the attack transactions will be logged.